A checklist contains important or required assignments, readings, or other items to complete. Each checklist contains one or more categories, into which checklist items are organised. 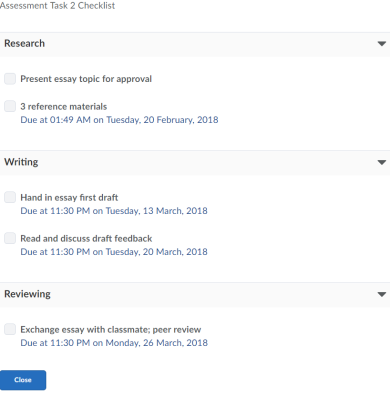 For example, you might have an “Assignments” checklist with categories for written assignments and quizzes, both of which could have multiple items that must be completed. How do checklists organise information? Checklists contain categories, which are used to organise checklist items. For example, you might create the categories Week 1, Week 2, and Week 3, and place week-specific checklist items into the appropriate categories. Alternately, you might use a checklist to organise steps of an assignment. You can assign due dates for checklist items. Click Checklist > New Checklist. From the context menu of the checklist for which you want to set release conditions, click Edit. Click Attach Existing, then select the check box for any condition you want to attach. Click Attach. Click Create and Attach, then select a Condition Type from the drop-down list. Complete any additional Condition Details that appear and click Create. To set how accessing the checklist is controlled, from the drop-down list, select if All conditions must be met or Any condition must be met.